The reach of the Washington bureaucracy is apparently without limits. Presumably cooler heads will prevail but the National Labor Relations Board has taken steps that might render useless Boeing’s investment of $2 billion in its South Carolina plant which is intended to manufacture the new 787 Dreamliner. In 2009 Boeing announced plans to build a new plant to meet demand for its new 787 Dreamliner. Though its union contract didn’t require it, Boeing executives negotiated with the International Association of Machinists and Aerospace Workers to build the plane at its existing plant in Washington state. The talks broke down because the union wanted, among other things, a seat on Boeing’s board and a promise that Boeing would build all future airplanes in Puget Sound. So Boeing management did what it judged to be best for its shareholders and customers and looked elsewhere. In October 2009, the company settled on South Carolina, which, like the 21 other right-to-work states, has friendlier labor laws than Washington. As Boeing chief Jim McNerney noted on a conference call at the time, the company couldn’t have “strikes happening every three to four years.” The union has shut down Boeing’s commercial aircraft production line four times since 1989, and a 58-day strike in 2008 cost the company $1.8 billion. This reasonable business decision created more than 1,000 jobs and has brought around $2 billion of investment to South Carolina. The aerospace workers in Puget Sound remain among the best paid in America, but the union nonetheless asked the NLRB to stop Boeing’s plans before the company starts to assemble planes in North Charleston this July. The NLRB obliged with its complaint yesterday asking an administrative law judge to stop Boeing’s South Carolina production because its executives had cited the risk of strikes as a reason for the move. Boeing acted out of “anti-union animus,” says the complaint by acting general counsel Lafe Solomon, and its decision to move had the effect of “discouraging membership in a labor organization” and thus violates federal law. So the company gave the Seattle unions a chance at lucrative jobs for decades and they tried to get an even bigger bite of the apple. Boeing (BA) rather rationally decided that it probably wasn’t a sound business decision to foreswear ever building another plane in any other venue and moved on to greener pastures. Oh, and its CEO opined that strikes were bad for business. In the Orwellian world that the Obama administration and its regulatory apparatus are constructing that bit of honest commentary amounts to a high crime against the working man remedied only by capitulation to the original union demands. Assume that the NLRB does indeed intend to pursue this to its logical conclusion. 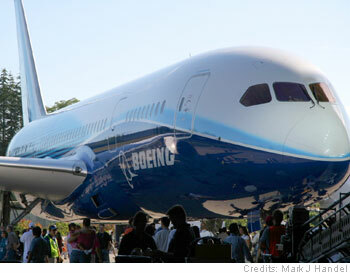 Boeing is forced to kiss of a cool $2 billion and manufacture the Dreamliner in Seattle. Given no alternative but to use union labor in Seattle, what possible constraints on union demands would exist? Though it will take time, the ultimate outcome of a Boeing loss is sadly predictable. Think Detroit.